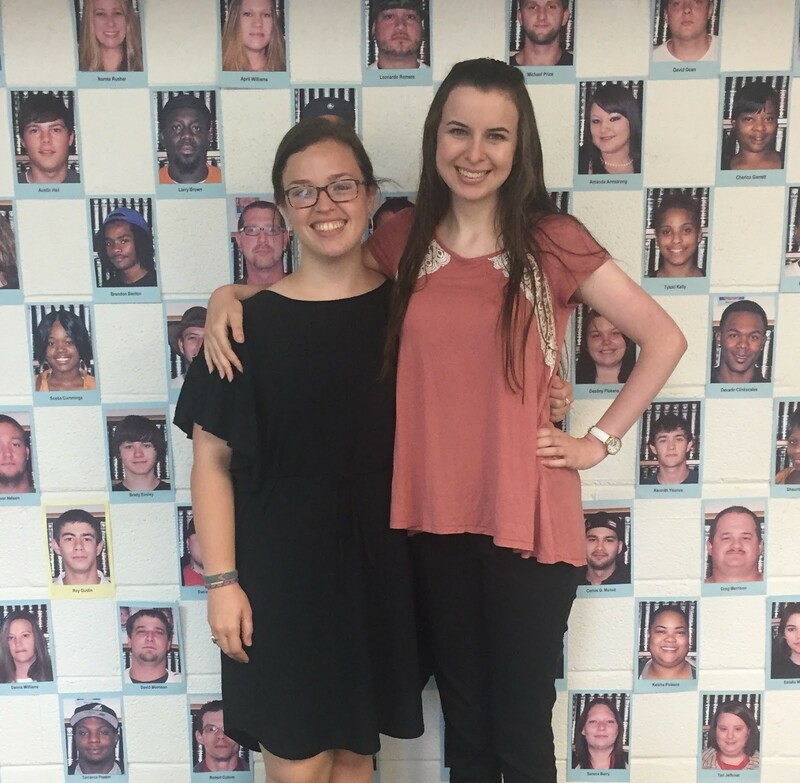 Katherine Armstrong (left) and Rachel Lawrence interned with UM this summer. As interns at United Ministries, we have spent our summer making our way through the different programs offered at UM, and while we came into this summer with expectations of what we might learn, we have also been taken by surprise. We have always known that we lead very privileged lives, but over the course of this summer, it really sank in how the things we take for granted help us more than we ever realized. We knew that not everyone has been able to pursue a college education, but we never realized that we already have more education than others may ever receive. By working in the Adult Education program, we understood for the first time how big of an impact the high school education that we took for granted has had in our lives. During our teenage years, we never thought of high school as more than just what was expected of us. We may have joked about wanting to leave, but we never considered leaving or even knew how to. We didn’t realize how fortunate we were to not even be vaguely familiar with circumstances that could make staying in school difficult or even impossible. We thought our lives were perfectly standard as we walked across the stage at our high school graduation, without ever recognizing the doors that were just opened for us. Those same doors are still closed to so many people who did not get this same chance. Until this summer we never really understood how much of a difference a high school diploma or GED makes for those who don’t have one. We also never completely understand that the way we were raised shapes the way we interact with and interpret the world. We couldn’t see the forest for the trees, so to speak. We grew up in a world where children went to school, went to college, got a job, worked for sixty years, saved, and retired. This pattern has been ingrained into us. During our childhood, we were consistently taught about money management. We both attended a money management themed camp at our church where we learned about saving money, investment, how to write a check, and principles of work and entrepreneurship. These principles and skills have been taught to us from a young age, and it never occurred to us that others may not have had the same education when these skills are so vital in today’s society. For those that do not receive this education, it can be difficult to understand how to get your feet under you. We didn’t realize that, once again, what we take for granted is part of a culture that is not universal – even within our city. This creates an inequality that we were blind to previously. Fortunately, we also saw that United Ministries has a solution to this problem that we never even knew existed. The Employment Readiness program at UM works to give so many the vital education and tools that are necessary in this society to achieve financial stability and independence. Another thing that we have learned at United Ministries is how important the role of relationships is in connecting to people and changing lives. Everyone who comes to United Ministries has their own story and history that has shaped their lives and brought them to this organization. It has been a blessing to meet people and hear about their lives, their hopes, and their dreams for a brighter future. We admire the bravery and vulnerability that the people who enter United Ministries’ programs have in sharing the good and the bad as they go through their journeys. Under no circumstances are they required to share why they’re there or what they’ve gone through, but many participants share of themselves gladly and freely. 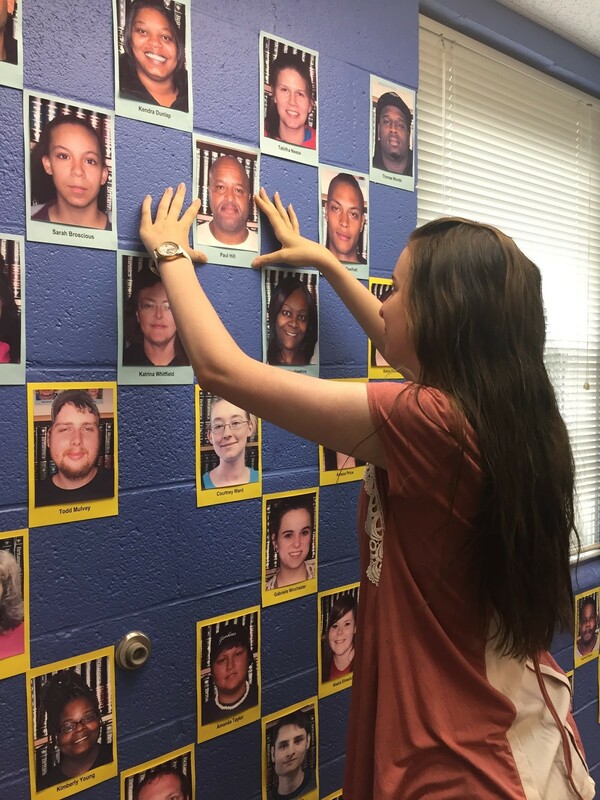 Rachel places a picture of a participant on the wall at United Ministries. At the end of the day, we are not going to remember the academic lessons we taught as much as the conversations we had and relationships we built. We will remember a summer of seeing the true bond between volunteers, workers, and participants as they all worked towards a common goal. We will remember the joy that is felt by all when someone succeeds, the familial teasing and joking between people who have interacted for years, and the easy community that United Ministries creates so seemingly effortlessly. This summer has provided us with learning experiences that we will remember forever, but more than that, it has provided us with the opportunity to pass along what aid we can give to others and to see the good work that is being done to change lives in our very own community. Rachel Lawrence attends Anderson University and is majoring in Music Education. Katherine Armstrong attends Clemson University, majoring in Mathematics Education.